The Archaeology of Ancient Greece provides an up-to-date synthesis of current research on the material culture of Greece in the Archaic and Classical periods. Its rich and diverse material has always provoked admiration and even wonder, but it is seldom analyzed as a key to our understanding of Greek civilization. Dr. Whitley shows how the material evidence can be used to address central historical questions for which literary evidence is often insufficient, and he also situates Greek art within the broader field of Greek material culture. Part I. Approaches to Greek Archaeology: 1. Introduction: classical archaeology and its objects; 2. 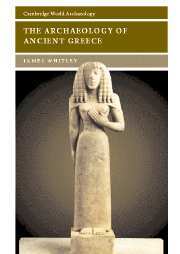 Great traditions: classical scholarship and classical archaeology; 3. Modern archaeologies of Greece; 4. Chronology and terminology; Part II. Archaic Greece: 5. Archaic Greece, 1000–700 BC; 6. The Aegean, the Levant and the West: the orientalising phenomenon; 7. Gods, heroes and sacred places; 8. The city, the state and the Polis; 9. Art, narrative and monumentality; 10. Regional archaeologies; Part III. Classical Greece: 11. Defining the classical: classical art; 12. Cities and sanctuaries of Classical Greece; 13. The archaeology of democracy: Classical Athens; 14. Beyond the Polis: the countryside of Classical Greece; 15. Epilogue: towards Hellenistic archaeology.